Fall is my favorite season. I love everything about it, the cooler weather, the changing colors, the smell of pumpkin spice candles, desserts made with pumpkin. There is something about pumpkins that just screams fall, when you see a pumpkin you automatically think fall, whether it makes you think of harvest time or jack-o-lanterns at Halloween or pumpkin pie for Thanksgiving. I wanted to make something to put up in my house to decorate for fall, I wanted something that would last for a couple of months so I decided on pumpkins. 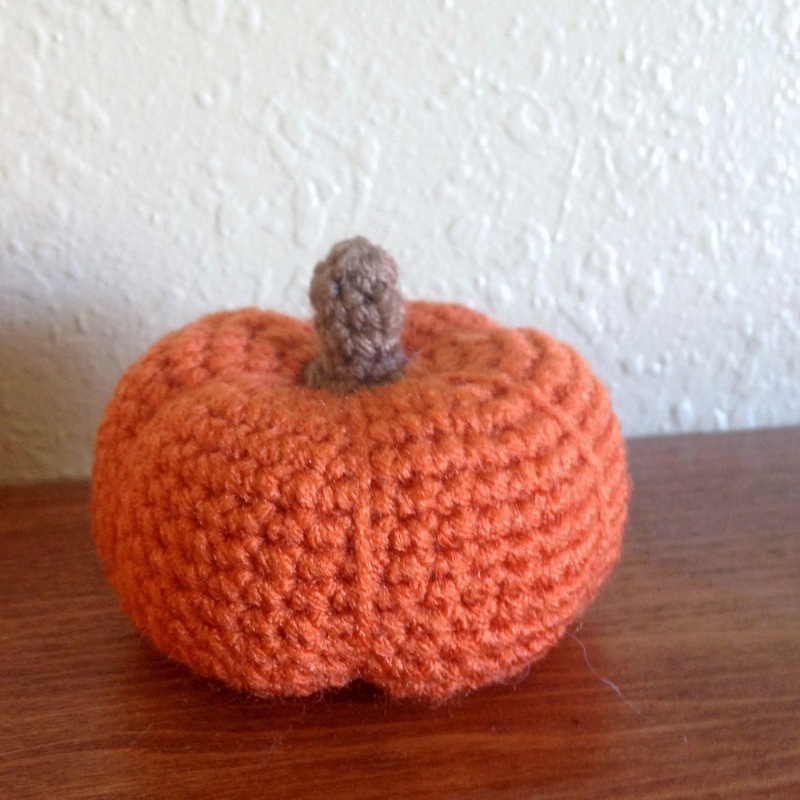 I made a crocheted pumpkin a couple of years ago that was like a tube that was cinched up on each side and stuffed and I was never really happy with how it turned out. This time I wanted to try to make something that I felt looked a little more like a pumpkin and I wanted to make a couple different sizes. These two pumpkins are what I came up with. The larger one is about 4 inches tall without the stem, 5 inches tall with the stem, and about 5 1/2-6 inches in diameter. I made a curly vine that I attached to the large pumpkin but either one could be done with or without the vine. The pumpkins are made exactly the same way. The only difference is the number of increase rounds, to make it bigger or smaller around, and the number of straight rounds, to make it shorter or taller. 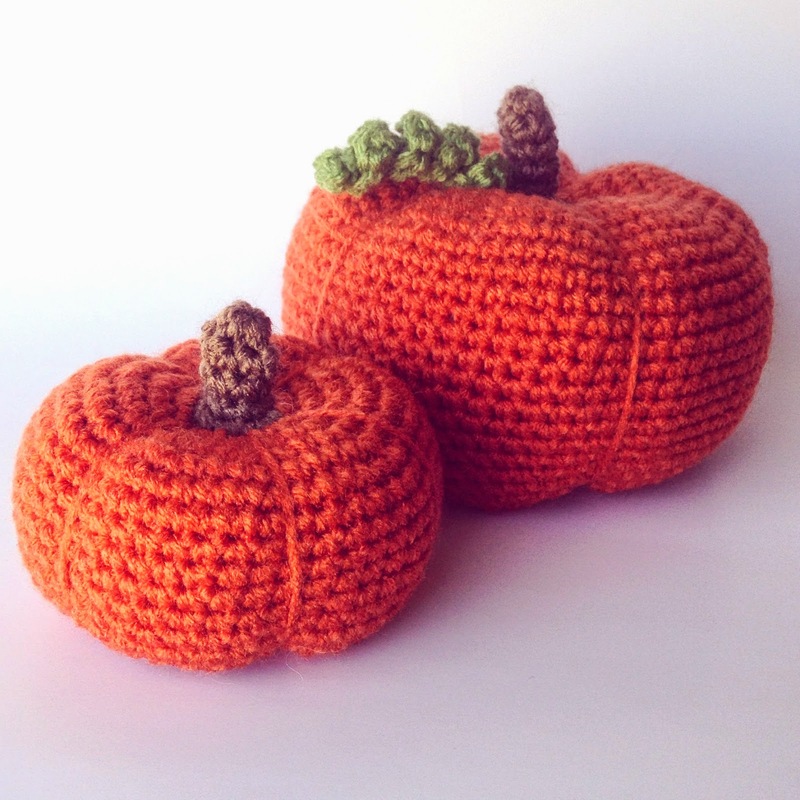 Really you could use this pattern to make any size pumpkin you want. My only caution is that you have to be careful with how tall you make it because you want to be able to get a needle through from top to bottom. 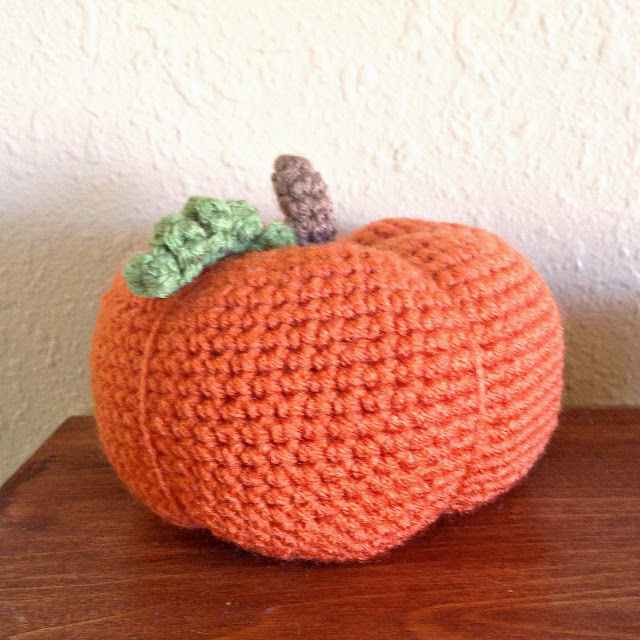 I kind of want to try experimenting with a taller pumpkin, I wondered if a small crochet hook would work to pull the yarn through. My biggest worry with that is that you might pull a lot of stuffing out too. 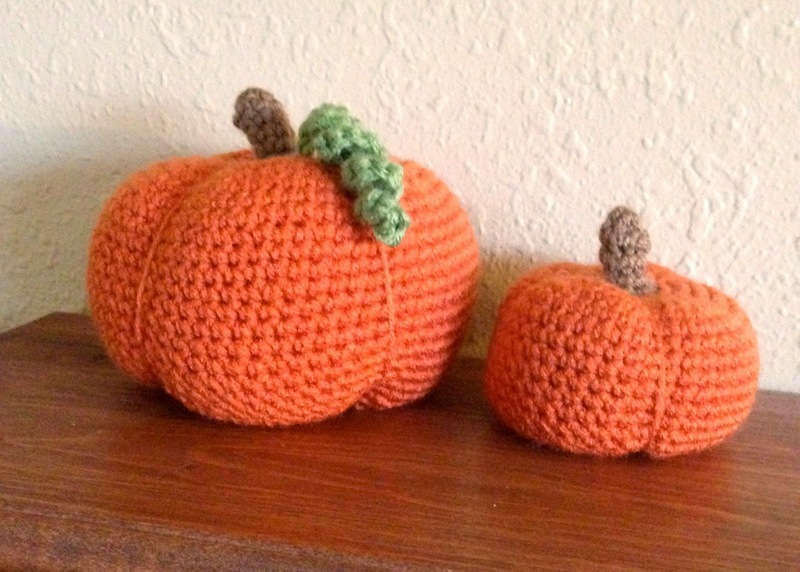 I also think it might look cute to make the smaller diameter pumpkin with the height of the larger pumpkin to see if it gave more of a tall skinny pumpkin look. Basically, you can use this pattern to make a pumpkin as short or tall, fat or skinny as you want provided you can get a needle through the middle. This is the end of your increase rounds, if you want a fatter pumpkin you can keep increasing until you have the size you want. The increases are in multiples of 9. You can continue in the same way for as long as you want simply adding one more sc before you increase on each round (1 sc in 6 stitches, increase, would give you 72 sc; 1 sc in 7 stitches, increase, would give you 81 and so on). As you are crocheting your increase rounds your circle will not lay flat. It will be all wobbly on the edge. This is right, it will look better as you get the straight sides done. 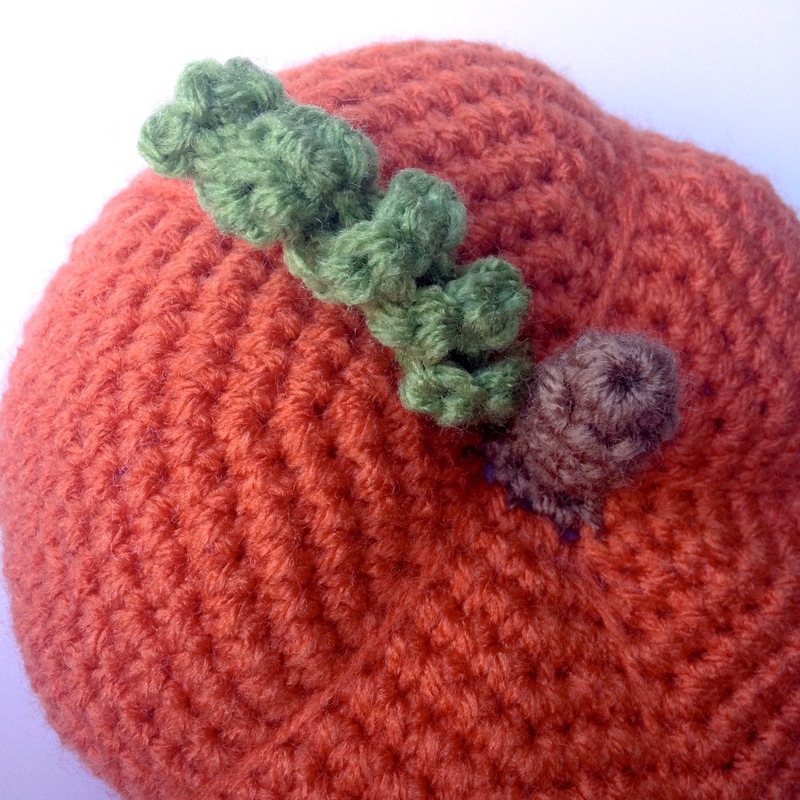 The top of your finished pumpkin is all not flat, the wobbliness helps give the bumpiness to the finished pumpkin. You should have 16 straight rows, but as I mentioned at this point you can keep going for a taller pumpkin or stop sooner for a shorter one. Cut yarn very long, thread onto yarn needle and weave through stitches on last round, pull to cinch closed and stitch to secure. Now insert you needle through the top of your pumpkin near the stem all the way through the center of your pumpkin and out the bottom. Pull tight to squeeze the pumpkin a little. Repeat that as many times as you want around the pumpkin. I did it 5 times around. It doesn't matter if they are evenly spaced, the bumps on a real pumpkin are not spaced perfectly. With green yarn ch 18, turn, 2 sc in each ch. 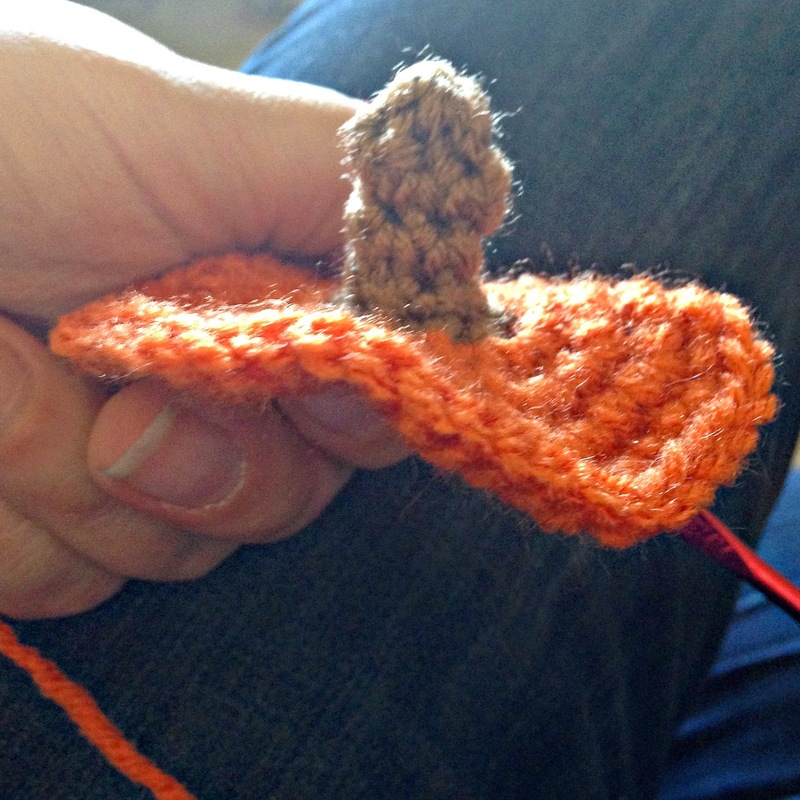 Work in the round, starting with brown yarn. Finish the same as the large pumpkin. 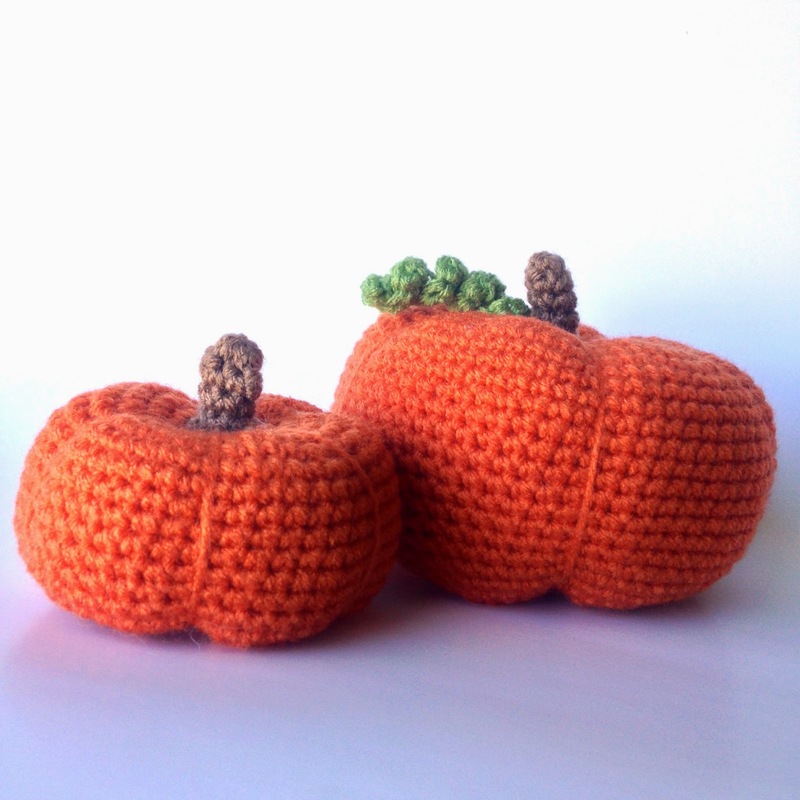 I hope you enjoy this pattern and have fun making some pumpkins to add to your fall decor. 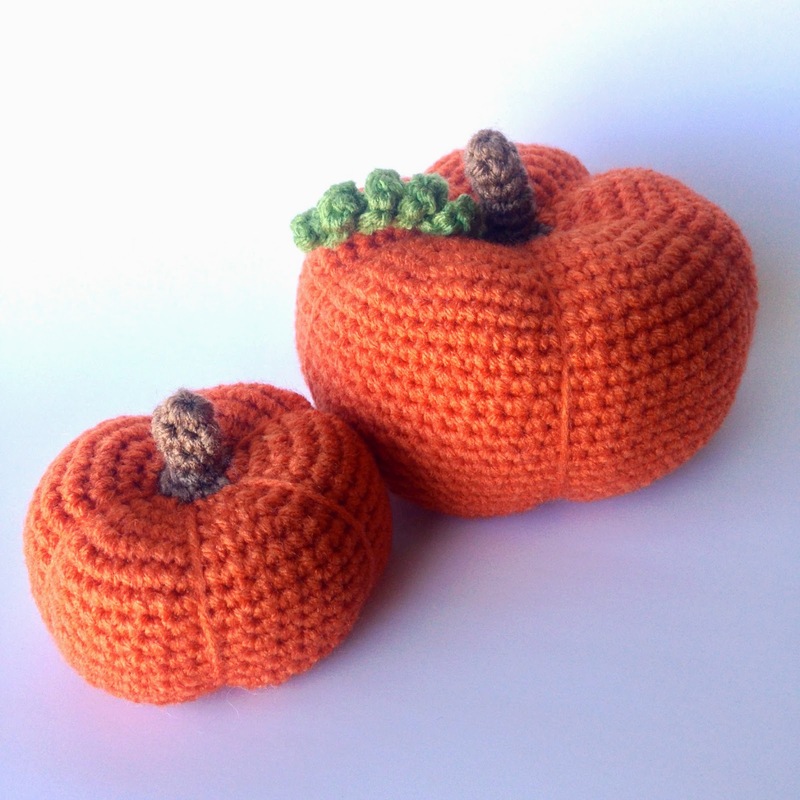 oh these pumpkins are so cute! 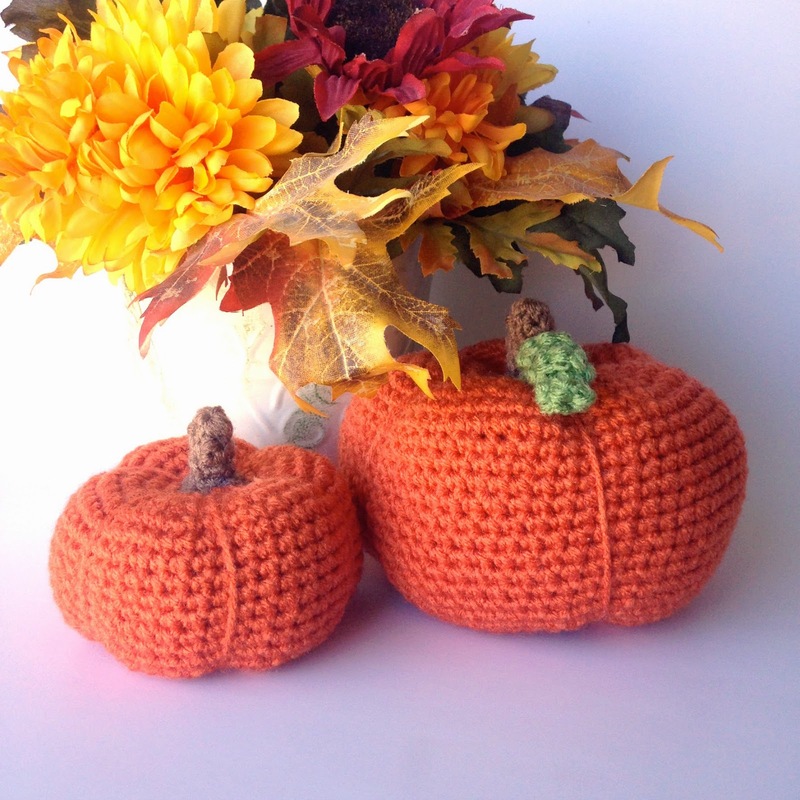 They would be awesome for decorating or for snuggling :) Thanks for sharing the pattern!! I love them! Hope I can make them for the Thanksgiving table!!! What's the difficulty level? My mom and I are relative beginners but love your pattern! I don't understand why posters don't answer their questions after they post. I hope you don't mind me answering for Erica. 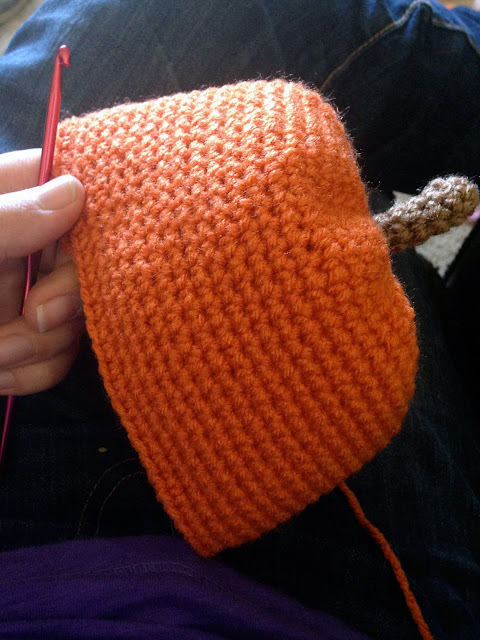 I've been crocheting since I was 17 and am a grandmother so I've been crocheting for many years. If you can make a granny square, I think you can make these. I'd suggest going to youtube and look for a video. You may get lucky and find someone making something like this. With crochet it's easy to rip out if you make a mistake. Good Luck! If you leave a long tail at the beginning then pull it up throught the middle as you stuff it ; then you can cince it up without having to even use a needle. You could try doll needles...they are about 6 inches long. Love this pattern! Works up so quickly!